Do you feel that you lack power and direction in your spiritual walk? Does ministry seem like just more stuff to do? This book reaffirms the new identity we have in Christ and shows the way to a faith that is about being rather than doing. Full of engaging real-life stories from the author's own faith journey. Have you ever thought, 'I'm a Christian, but I don't feel like a believer with power, or direction.' And doing ministry just amounts to working a little harder at church stuff.' Always doing more stuff. What if your faith was more about being than doing? 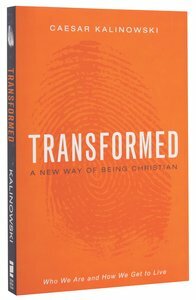 In Transformed, author Caesar Kalinowski, shows us that when we became a Christian everything about us changed in an instant. We received a new identity based on who Jesus is, not on who we were. As believers, we literally became part of God's family of missionary servants. Disciples who make disciples. This is who we are---not what we do. Being a Christian leads to vibrant new ways of doing life and experiencing relationships. In his new book, missional leader Caesar Kalinowski points the way to discovering the transforming power of Jesus in every aspect of our lives. Naturally. Authentically. Right where God has placed us. Transformed looks realistically at the identity we have been given in Christ and how it can shape every aspect of our lives. It is truly good news that sets us free from performance-driven spirituality and guilt. Our hearts draw closer to God, and God leads us to radically change every experience of our life on every day! Drawing on stories from Caesar's own journey and life in a community of believers, Transformed is wonderfully illustrated throughout with real life stories that are exciting, funny and always relatable to ordinary people in every-day life. CAESAR KALINOWSKI is a church planter, missional strategist, coach and one of the founding leaders of Soma Communities and the Executive Director of the GCM Collective. He is a spiritual entrepreneur and an avid storyteller. He has worked in over 17 countries around the world including Sierra Leone, Sudan, Nigeria, Burma, India, Latvia, Romania and the Czech Republic. He has been married to Tina, his high school sweetheart, for 28 years; they have three children, Caesar IV, Christin and Justine.